Four-time Oscar nominee Ed Harris, Jim Sturgess and Oscar nominee Saoirse Ronan and Colin Farrell star in this epic saga of survival from six-time Oscar-nominee Peter Weir. In 1940 seven prisoners attempt the impossible: escape from a brutal Siberian gulag. Thus begins a treacherous 4,500-mile trek to freedom across the world's most merciless landscapes. They have little food and few supplies. They don't know or trust each other. But together, they must withstand nature at its most extreme. Their humanity is further tested when they meet a teenage runaway who begs to join them on their quest. 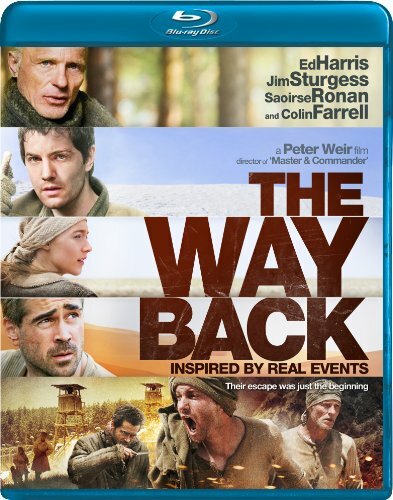 On April 19th, Image Entertainment will release The Way Back on Blu-ray & DVD. Four-time Oscar nominee Ed Harris (Apollo 13), Jim Sturgess (Across the Universe) and Oscar nominee Saoirse Ronan (Atonement) and Colin Farrell (In Bruges) star in this epic saga of survival from six-time Oscar-nominee Peter Weir (Witness, Master and Commander: The Far Side of the World). Four-time Oscar nominee Ed Harris (Apollo 13), Jim Sturgess (Across the Universe) and Oscar nominee Saoirse Ronan (Atonement) and Colin Farrell (In Bruges) star in this epic saga of survival from six-time Oscar-nominee Peter Weir (Witness, Master and Commander: The Far Side of the World). Inspired by an incredible true story, The Way Back begins in 1940 when seven prisoners attempt the impossible: escape from a brutal Siberian gulag. Thus begins a treacherous 4,500-mile trek to freedom across the world's most merciless landscapes. They have little food and few supplies. They don't know or trust each other. But together, they must withstand nature at its most extreme. Their humanity is further tested when they meet a teenage runaway who begs to join them on their quest. A compelling testament to the human spirit, this gripping wilderness adventure is "Peter Weir at his hypnotic best" (Telluride Film Festival). Special Features: Behind the Scenes Featurette; Trailer. Image Entertainment, Inc. (OTC: DISK.PK) is a leading independent licensee and distributor of entertainment programming in North America, with approximately 3,200 exclusive DVD titles and approximately 340 exclusive CD titles in domestic release and approximately 400 programs internationally via sublicense agreements.� For many of its titles, the Company has exclusive audio and broadcast rights and has digital download rights to approximately 2,200 video programs and over 400 audio titles containing more than 5,500 individual tracks.� The Company is headquartered in Chatsworth, California.� For more information about Image Entertainment, Inc., please go to www.image-entertainment.com.